To produce this 30mm 6×36 stainless steel wire rope we combine one of two core types with 6 bundles of 36 wire strands, delivering impressive sturdiness in conjunction with moderate flexibility. Other diameters of 6×36 wire rope are available, so a whole host of lifting duties are achievable. The first core type that is available in partnership with the 6×36 outer layer is made using fibre. This allows a level of elasticity and fatigue-resistance that could come in handy. The WLL of 47,532kg is the lesser of the two, as is the 466kN breaking force rating. The second is an independent steel wire core, which lets you double down on strength and handle loads of up to 51,277kg with confidence. Always remember to take heed of the operational parameters of any wire rope you use, since failing to do so will have serious consequences. Expand your journey to find stainless steel rope and you will find many varieties of corrosion-proof configurations at Rope Services Direct. For the ultimate in strength, our 8×25 compacted rope will leave you suitably impressed, offering capacities of up to 57.92 tonnes at a diameter of just 24mm. For improved flexibility, check out our 7×19 configuration rope, which is especially effective in the construction of wire rope slings. To get the wire rope you need supplied direct to your location, call 01384 78004 or email RSD for more information and quotes. 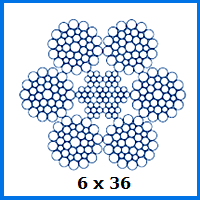 30mm 6x36 Stainless Steel Wire Rope Overall rating: 5 out of 5 based on 6 reviews.